Why Tunis indeed? For Lower, the question cannot be approached reductively. The Tunis Crusade was not simply a matter of logistics, an opportunity for conquest or conversion, a money-grab; rather it was all these and more. Lower saves his answer to the question until chapter 6, giving him the opportunity to carefully build his argument in the preceding chapters. 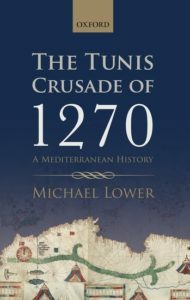 Fully half of his volume focuses on the pre-history of the crusade, beginning with Louis IX of France’s disaster at the Battle of Mansurah in 1250; for Louis the Tunis Crusade was a matter of unfinished business. Lower sets up two paired relationships: between Louis and Baybars, the Mamluk sultan of Egypt; al-Mustansir, the Hafsid emir of Ifriqiya, and Charles, the Capetian-Angevin king of Sicily. Sometimes manifesting as collaboration and co-operation, sometimes as competition and conflict, neither relationship can be reduced to either. To put it very roughly, though, Lower describes in both Louis and Baybars a desire for each to promote his vision of religious unity, not to say dominance, both within and without their respective realms. For Louis this would redeem the failure of his first crusade, and for Baybars it would legitimise his somewhat unorthodox route to power. Facing each other across the straits between Ifriqiya and Sicily, Charles and al-Mustansir found themselves in a symbiotic yet competing relationship of commercial interdependence (the fortunes of the Sicilian grain market feature throughout this volume) and political ambiguity, neither entirely secure in his authority and each therefore a risk to the other. It is the relationships between these four which dominate Lower’s analysis. A key feature of Lower’s approach is to emphasise al-Mustansir’s and Baybar’s active agency in these relationships; this exemplifies his opening statement that historians of the crusades are well-placed to bring together European and North African/Western Asian history without privileging the European perspective (pp. 1–3); a crucial message to modern historians of crusading. Linguistic training of historians is an important part of this, and Lower’s familiarity with Arabic as well as the more usually-expected Old French and Latin adds important nuance to his interpretations (as well as helping to resolve some issues where the Latin and Old French sources alone simply cannot be reconciled). Interwoven between the unfolding story of the complex relationships of the four ‘dynasts’ (to adopt Lower’s terminology) is the crusading activity of Jaume I of Aragon and Prince Edward (later Edward I) of England (the expedition to the Holy Land of the latter admittedly something of a post-script in this volume); the growing significance of the Mongols in the Eastern Mediterranean; and the involvement of the Italian city-states in both economic and military activity with various parties across the Mediterranean basin. To refer to this crusade as simply ‘an expedition’ is an oversimplification indeed; in fact, ‘crusade’ is the only word broad enough to encompass all these facets. All this helps to explain how the trans- and intra-Mediterranean interactions of the central thirteenth century climaxed in crusade in the late 1260s. But why was this crusade diverted to Tunis, an especially vexed question given that most of the participants did not know that this was their destination until they were nearly there? From a military-historical perspective, Tunis made very little sense; it could hardly be said that a city so far from Jerusalem was a gateway to the Holy Land, as Egypt was perceived to be, and why should Charles engage in conflict with a neighbour who had not shown signs of posing an especially serious threat to his rule in Sicily? The abortive military engagements of the crusader landing at Carthage seem to underscore this problem, but Lower would have it that this is the wrong way of approaching the question. Traditionally portrayed as conflictual, Lower argues that Louis’s and Charles’s interests in fact coincided in Tunis, ‘with its enduring centrality to the Mediterranean-wide networks of conflict and collaboration that were crucial to the aspirations of both men’ (p. 173). Tunis more than anywhere else was a place where the protagonists of this crusade could hope to achieve conversion, conquest, and commerce. This argument is highly persuasive: why Tunis? Because it was Tunis. ‘The key to understanding the Tunis crusade […] has been hiding in plain sight. It is Tunis itself’ (p. 5). Lower’s far-reaching analysis has methodological roots which are signalled in the subtitle ‘A Mediterranean History’. He lays out his path as somewhere between the Mediterranean Studies of Fernand Braudel et al, and the ‘clash of civilisations’ school of Samuel P. Huntingdon and Bernard Lewis, but veers more to the former. That being said, the theoretical aspects of this approach are somewhat underplayed. Braudel is referenced very early on in the introduction, but more recent contributions to the field by Horden, Purcell and Abulafia (who is otherwise frequently-used in this volume) are not explicitly addressed. This certainly is a Mediterranean history of a crusade, much more than any other, with networks of exchange—be that commerce or conflict—the core theme, but further development of the theoretical dimensions could have made a greater contribution to the literature of Mediterranean Studies, particularly in the way Lower picks a careful path between the apparently opposing perspectives of conflict and commerce, and suggests a resolution to them by tracing a middle way. Joanna Phillips, University of Leeds.